Why Are We Worried About Carbon? The chemical element Carbon plays a big part of Earth’s climate change story. It interacts with our land, air, water, and us. Much of Dorothy’s research focuses on understanding changes in this global carbon cycle and their impacts on Earth’s climate. Carbon is a building block of life. It is our main source of energy, mostly from our burning of coal, oil and natural gas. When we burn carbon, Carbon atoms bond with Oxygen atoms to form carbon dioxide. We then emit this heat trapping gas into our air. The result is increasing global temperatures and far-reaching impacts on human and environmental health. Today, people around the world are dealing with the effects of climate change, even though much of the climate discussion surrounds implications for the distant future. Among her scientific interests, Dorothy is studying terrestrial carbon in extreme climate regions such as Alaska and Canada, both vast icy landscapes with freezing temperatures. 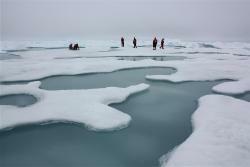 A stable climate in these areas is critical in keeping temperatures on Earth habitable and maintaining safe sea levels. Climate researchers like Dorothy are not only learning about Earth’s past climate in these regions, but also that these sensitive northern regions are dramatically changing. It is here where most of the world’s warming is happening. Loss of ice cover in Earth’s northern regions makes it harder for the planet to reflect the sun’s energy away from the planet’s surface. Adding to the problem, permafrost in the north is melting. We depend on these areas to store carbon. A big question for Dorothy is learning whether global warming already underway will result in more Carbon storage or less. On the one hand, as permafrost disappears in these regions, they become hotbeds for releasing carbon dioxide and methane emissions that add heat to our atmosphere. But a warmer climate can also lead to a more productive landscape with longer growing seasons, increasing the Earth’s vegetation that stores carbon. However, the probability of droughts increases in a warming world. 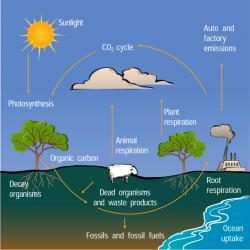 Droughts dry the land and cause peat to oxidize, decay and then return CO2 into the atmosphere. If the northern peatlands dry out and permafrost melts, more carbon will be added to the atmosphere, increasing warming and even fires. Dorothy is helping to solve an important piece of the carbon problem by studying peatlands. 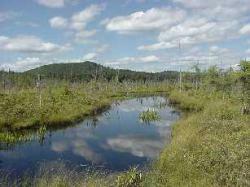 Peatlands are excellent archives of past carbon and the largest terrestrial store of carbon. Here Dorothy’s research intends to answer whether peatlands are carbon sources or as sinks, or combination of both. Carbon is constantly flowing in and out of the land, air, oceans and living things. When you think about it, this is really a budgeting problem. Like any budget, we need to know how much of something goes out, how much comes in, and how much is saved to use later. As for carbon, scientists study how much carbon leaves one reservoir and how much carbon enters another. Even though the carbon budget has stayed relatively balanced in the past and kept Earth’s climate stable for many years, things are now rapidly changing. Among the biggest uncertainties in the carbon budget are carbon sinks in our land and ocean, and how they will both change as the temperature increases. Earth’s carbon budget is being tested today. Peatlands, vegetation, forests, and permafrost are some of Earth’s major terrestrial carbon reservoirs. When these areas are diminished, the ancient carbon stored within them is released into the atmosphere, causing major climate disruptions that rivals the amount of fossil fuels humans are regularly emitting. We are seeing impacts from the increased release of carbon in our atmosphere from both terrestrial reservoirs and fossil fuels today on regional food and water supply. In the horn of Africa, serious droughts in the last sixty years have caused major crop failures, leaving up to10 million people at risk of famine. Arctic fires recently are unprecedented as seen from paleostudies of charcoal in lakes. The land can no longer keep up with basic human needs of food and water in many areas. In Asia, thousands of acres of farmland have been cleared to create palm oil. 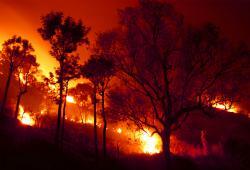 The destruction of the land has resulted in an increase in wildfires, seriously impacting the amount of carbon dioxide released into the atmosphere. With changing landscapes and increased fossil fuel production, Earth is potentially becoming increasingly unfit for agriculture in many areas and, in turn, people. Scientists like Dorothy aim to continue studying more about the past in order to learn how we can take on climate issues we are facing today seriously.